Having some trouble getting set up and hope someone can help. I’m running OH2 and have installed the latest binding. This is running ok and is talking with my ebus interface (ESERA RS232) though FTDI on /dev/ttyUSB0, which is connected to a Vaillant VRC 470f directly to the boiler unit. The problem I have is that I cannot for the life of me get it to recognise any telegrams - everything is marked as failed. I have been through the hardware setup instructions for ebusd and tried adjusting the potentiometer for hours. I am not able to get a stable AA heartbeat, just a few blocks every now and then. The stable signal position gives the results seen below. In the logs, the most common error is “Telegram starts with an invalid source address!” which happens 3/4 times a second. Each time the source address listed is different. Log snippet at bottom. I suspected it might have been a bad connection but have since replaced the cable with solid core, twisted pair CAT6 (ebus spec compliant) which made no difference. I have a strong suspicion that the ESERA coupler is at fault and am following in ChrisPe’s footsteps by ordering the new v2.1 ebus interface from John30 et al on the FHEM forums. They are putting it together and testing it beforehand so hopefully everything will be good soon. Shall update again once it arrives. Finally received the ebus 2 adapter developed by FHEM team, and it’s working very well. i have modified my esera ethernet adapter based on a prototyp for the usb adapter from galileo and the new informations from the fhem ebus adapter 2.0/2.1. this stuff is working very very well. my failure rate is now constantly below 8% instead of 75-80% before. i have a atmoTEC plus and would like to remote it with openhab2. I use a FHEM E_BUS adapter, but i don’t get any Temperature values. Is there an option, to adjust the potentiometer with ophenhab2? 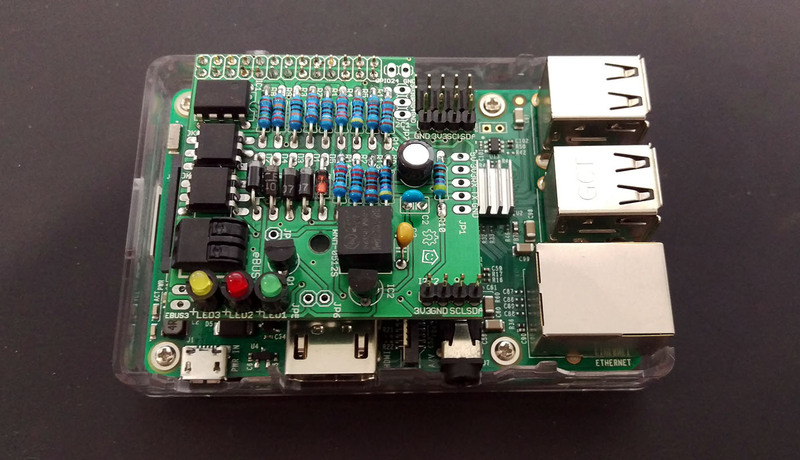 there is a new ebus adapter which could be connected directly on the gpio pins on the raspberry in the fhem forum (RPi). with this adapter there is a special device driver /dev/ttyebus, which must be used. but in the ebus bridge it’s not possible to select this device, only /dev/ttyS0 and /dev/ttyAMA0 is available. maybe there is a way to do this in a config file? I’m using the same adapter (just received mine last friday) and was not able to use the new ebus binding with it. a) the /dev/ttyebus has root:root permissions and not root:tty as most other serial devices. When I add openhab to the root group its still not working. I’ve send a mail to Galileo about changing the group permanently to tty but he doesn’t know how to do this. b) I also tried to add the /dev/ttyebus to the /etc/default/openhab2 file. At the moment I’m using the adapter with ebusd and mqtt support which sends me the readings with a cronjob every 5 minutes to my openhab. I hope we can make the ebus2 binding also work with the new ebsu2.1 raspberry shield. … regarding your question: in the paperui I’ve added “/dev/ttyebus” in the Ebusd bridge settings under Serial Port. It’s a text field so you can put everything you want there. Uh, it looks like that the rpi driver is not really a serial device. And the serial support depends on nrjavaserial. But you could try to use socat to create an ethernet connection. @sebastian: did you manage it to remove the /dev/AMA0 device? If you mean to remove it in general from the /dev/ folder, yes. You can do this via the raspi-config menu. See instructions here: https://github.com/ebus/ttyebus make sure that you disable both, the login shell and the serial port hardware. Before you use the ebus2.0 binding I would make sure that your adapter works with ebusd. maybe we are going offtopic, but yes i mean the remove of the device in the dev folder. i use openhabian and with the openhabian-config it didn’t work, also if i did it manual. my traffic light on the adapter flash (working), but as soon i go into the bridge config (even i didn’t save anything), this will not work again until i reboot the raspberry. maybe we open a seperate thread to get the RPi adapter with the ttyebus driver and ebus 2.0 binding working? This a feature of a newer OH2 version. But you could try to define a thing for the bridge. Maybe I find time next days to create an example. i’m on latest stable and now i switched my testing enviroment to the latest unstable 2.3.0 build 1224. The addresses used in this example are not correct, it should only show how it works. As I understand a physical device can have several SAs (in my case up to 5). is that correct? I’m somehow surprised that I can only pull quite limited meaningful data out of the ebus. I would have expected more. Is the reason that only the standard ebus thing is being used or are there any other explanations for it? In fact my Wolf components are WPM-1, BM-1 and two MMs. Is there a way to get more out of these devices, e.g. by using more specific things? If yes, which ones and how should they be configured? As I’m a total beginner, I guess that I will not be able to program my own parsers. Could the telegrams where the log says that no handler exist by extracted (e.g. MA 70 or F0)? Unfortunately this does not work. The only way how can link ebus data to an item is via paper-ui in the thing configuration section of the thing (standard ebus). So my question: is it not possible anymore to link ebus data via items file? If still possible, what is wrong with my command? Sorry for the short answer. But is is not possible without a thing anymore. But you can create a thing text files without paper ui. Thank you already very much for the hint regarding my last post. Have you seen my second last post as well (5d ago). I would be very thankful to get some hints on that. I’m sorry, but currently my whole family is sick. So I can’t spend time on openhab at the moment. But I have your post on the radar. But feel free to remind me in 3-4 days. Okay a short try. You should add two wolf mixer modules manually with slave address 51 and 52. And you could try to add a BM2 for your BM1, maybe some commands are compatible. My BM2 uses slave address 35. @csowada thank you for your hard work ! Any ideas how to enable communication? this is about permissions?